My guest today on Triclinium is Barbara Gaskell Denvil. Born in England, Barbara grew up amongst artists and authors and started writing at a young age. She published numerous short stories and articles, and worked as an editor, book critic and reader for publishers and television companies. She broke off her literary career to spend many hot and colourful years sailing the Mediterranean and living in various different countries throughout the region. 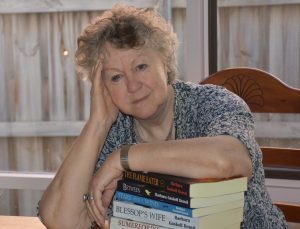 When her partner died she needed a place of solace and came to live in rural Australia where she still lives amongst the parrots and wallabies, writing constantly, for her solace has now become her passion. 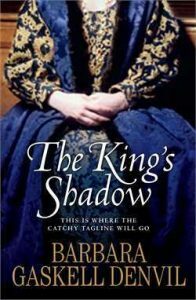 With a delight in medieval history dating back to her youth, Barbara now principally sets her fiction in medieval England. She also writes fantasy, tending towards the dark. Within these two genres, she now writes full time. You can connect with Barbara via her website and Facebook. A complete list of her many books can be found on her Amazon Author page. I hope you enjoy reading about her sources of inspiration. I would probably have thought I was a changeling if I hadn’t wanted to write from an early age. My father was an artist, my mother a teacher and my elder sister published her first novel when she was just sixteen. All our household friends were authors or artists and conversations over dinner endlessly concerned the arts of one kind or another. I wrote fairy stories when I was six, read every book in the house – and there were thousands, and dreamed of becoming an author myself. I started my career by publishing short stories and articles, working for a large traditional publishing house, and also for commercial television. Yet I ended up being the odd one out because then I had a wildly inappropriate love affair with someone who didn’t even read comics, got married and settled down to what I erroneously thought would be an ideally settled and domestic life. Silly girl. I have three wonderful adult daughters now but there has never been anything remotely settled about any part of my life, and it is only in the past fifteen years since coming to Australia that I have started writing novels full time. I am now writing a novel set in the time of Henry VIII, the first Tudor novel I have written, and the inspiration has been the peculiar and dangerous character of the king himself. But this historical novel is a long way from being finished, and now I am publishing a very different book. Fair Weather is set in the early 13th century during the reign of bad King John, but although there is considerable historical background, this is actually a time-slip story with a large paranormal element. It is a dark mystery and perhaps my favourite of all the books I have written so far. There are two heroines and a very sinister semi-hero, who entirely invented himself in my head as I was writing. The theme of ‘Fair Weather’, as with many thrillers, is the battle of good against evil. But there are many avenues through which good and evil become entwined. The historical setting is always something I love exploring in my books, and creating an authentic atmosphere is important to me. It is not usually the palaces or royal courts which fascinate me, but the taverns and markets, the river traffic and the villages, along with the ordinary people, the thieves, prostitutes, craftsmen, innkeepers and travellers. So then, in this novel Fair Weather, I contrast that distant past with the world of modern convenience and comfort – the plumbing, television, cars and computers. Well! That’s some contrast to the year 1204. But I have delved deeper than simply differences in time. 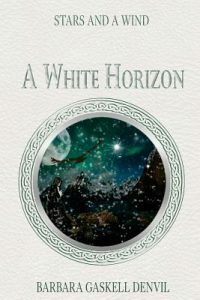 This is a novel which also uncovers the old myths and cult of Lilith, and those who battled within the ancient arts of alchemy. I am an ardent lover of history, research and generally digging into the past. I was originally attracted to archaeology, nearly joined a team in Norway uncovering the beauty of its Viking past, and also considered palaeontology. There are many specific periods that interest me more than others, such as the lost idealism during the horrific French Revolution, and then the Napoleonic wars which grew out of that desperation, the earlier English Restoration period, Tudor times, and in particular late medieval in England during the reigns of Edward IV and Richard III. All these periods seem to be based around the human endeavour to improve life, and yet invariably circumstances created disaster instead. The past has certainly shaped the present, and that fascinates me too. But my love of the late medieval is based more on the dreams I have had for so long, of those shadowed cobbled lanes, or the castles in their prime, and of the life of ordinary people 500 years ago when comfort was counted as the simple possibility of saving life and limb for another day. Most of my research has been acquired through reading. I have studied at the British Museum Library in the past (it’s a very different place now), and then in every library I could find. I have my own small library of about a thousand books, and love them all. But now I tend to utilise the internet more and more. My eyesight is failing and reading small print has become utterly impossible. On screen I can enlarge the print, and there are many, many resources, even though one must be careful not to believe everything that some people have put on there. Because of my miserable eyes, my love of research is fading, but I still manage whatever I can and I write nothing without being convinced of its accuracy. Gosh – all of them. My adoration for fantasy probably started with J.R.R. Tolkien although I had read fantasy books and loved them before Lord of the Rings was published. Dorothy Dunnett was a great inspiration for writing historical fiction, and so was Mary Renault. But everything I have ever read has influenced me in some way, even the books I thought poor. They taught me what not to do! And although my large collection of books is about half non-fiction, the other half contains a multitude of fictional novels by many hundreds of beloved authors. I just love books! Curse – march up and down – sit down and close my eyes and think – look up my ancient Roget’s thesaurus, and finally go and make a cup of tea. Something always comes to me eventually. Once again, there are hundreds. Perhaps thousands. My father was an artist and so were most of his friends, who also befriended me. I and my sister went lovingly to art galleries on regular occ8asions, and my father owned a huge number of art books and paintings. My walls are now crammed with paintings – some of them my father’s – but others which I have also collected. 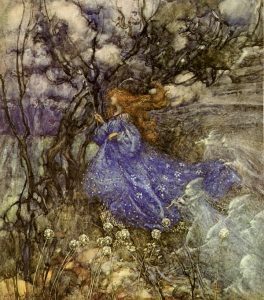 Probably my favourite artists are Durer, Turner, Rackham and Dulac. I find these magical elements really move me, cheer me up and inspire me. The beauty and pure excellence of line and depth elevates me and proves something beyond the dull everyday grind. Turner may not be considered a surrealist, but he saw the world through the eyes of a loving dreamer, and the world has never looked more beautiful than within his work. I’m a bit of a traditionalist, but there is some stunning modern art too. Music does the same sort of thing for me and some of the great classics move me to tears and inspire me enormously. I often play music while I write. To dream, never to be satisfied and therefore to polish and endlessly improve by rewriting, rewriting and rewriting again. Oh, and never to give up on those dreams and goals. Tell us about your new novel Fair Weather. Writing a combination of detailed historical atmosphere and the wild imagination of dark paranormal elements, was an enormous pleasure for me. I developed a particular close friendship with my characters in Fair Weather, and the elusive and troubled Vespasian Fairweather became a genuine friend. Not an easy friend, perhaps, but certainly unusual. The plot sweeps time aside, and concentrates on the characters and the threat of evil. My favourite book is always the one I am writing at the time, but Fair Weather has stayed with me as perhaps my all-time favourite. It is an unusual combination of the dark and the light, love and hate, past, present and future. This is a dark story of murder and alchemy, but I had great streams of inspiration pushing me onwards and it is probably the book I have most enjoyed writing. Vespasian, my very unconventional and sometimes fearsome hero, is very alive in my mind. I don’t think he is ever going to let me go. I shall enjoy hearing what my readers think of him. The light goes out. Distant echoes of thunder diminish into the night. Then through the absolute black, a thin blue line slices like the cut of a knife. Dawn is bringing a whole new world. Molly has dreamed of it before. But this time her eyes are open and she is wide awake. She shivers. Then everything changes again. It is a world of buzzing chatter, markets, the calls of birds, bright sunshine and the cobbled alleys of old London. There is gossip and the kiss of friendship, a glitter of silver rain across the river, laughter outside the tavern, and the shouts of children chasing each other through the muddy lanes. Squelch between the toes, the flap of fine linen around the ankles, and happiness in the air. But when Molly turns and blinks, everything dissolves into shadows once more. She does not know whether she has gone into the past or the future. She recognises the stench of blood. Then she hears the sirens of the police cars, and they are coming closer. 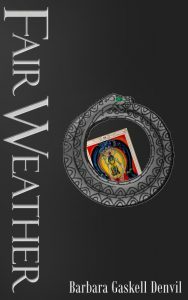 Fair Weather is available on Amazon US, Amazon UK and Amazon Australia. Many thanks Barbara! Good luck with Fair Weather!